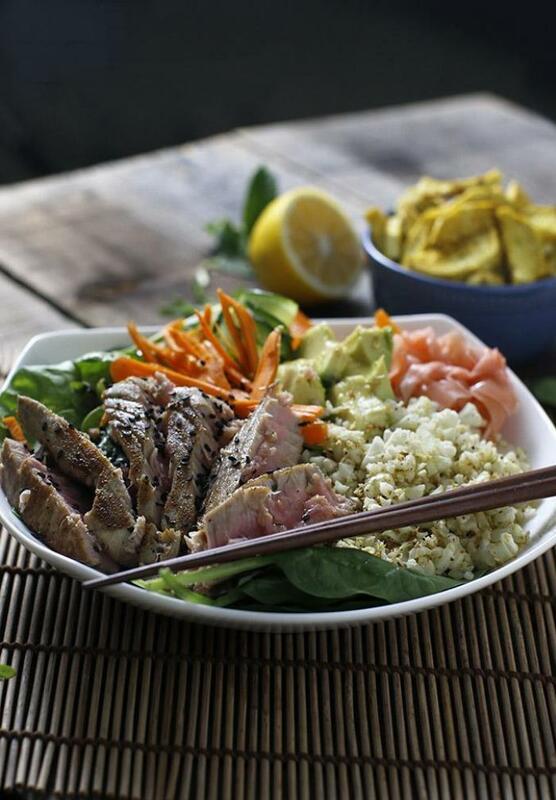 A sushi salad made with warm ahi tuna steaks and fresh vegetables, pickled ginger and wasabi! Dressed in a toasted sesame, lemon and orange citrus vinaigrette. 1Preheat the oven to 410º. Cut the sweet potatoes into crescent shapes. Prepare the vegetable toppings: julienne carrot, bell pepper, slice up an avocado and use a peeler or mandolin to strip cucumber into ribbons. 2Make fish marinade: whisk together coconut aminos, sesame oil (listed under salad ingredients) and ginger in a medium bowl; set aside. 3Make salad dressing: Combine all of the vinaigrette ingredients together to make the dressing and set aside. 4Raost potatoes: Toss potatoes in olive and garlic oil, curry, paprika, salt and pepper in a medium bowl. Then arrange potatoes on a parchment-lined baking sheet so that they don't touch (use two pans if needed). Roast for 20-25 minutes or until bottoms are golden brown. 5Cook cauliflower rice: Sautee in a pan on medium heat in olive oil. Stir every minute or so for 4-6 minutes. Salt and pepper to taste. Set aside. 6Prep tuna: Rinse tuna and pat dry with paper towel and place in marinade. Coat in marinade and then salt and pepper both sides. Marinate, covered, for a couple hours, or if short on time, cook immediately. 7Cook tuna: Heat coconut oil in a pan on medium-high heat and place tuna in pan. Pour some marinade on the top. Sear fish for 2 1/2 minutes on each side for medium-rare doneness. (For rare, 1 to 1 1/2 minutes on each side.) Remove and let rest for 5 minutes. Slice with a sharp knife against the grain. 8Assemble salad: plate the greens and veggie toppings (including cauliflower rice). Place tuna slices on salad and drizzle vinaigrette over salad; toss salad if preferred. Place ginger and wasabi on top and sprinkle salad with black sesame seeds. Serve with side of sweet potatoes. *For low FODMAP, limit cauliflower rice to tolerated amount or sub with your choice of rice. Limit to 1/4 of an avocado and 1/2 C of sweet potatoes per serving. Keep sesame seeds to small amount.